When designing the System Blue Professional Brass series, we tried to take everything into consideration. One of the big concerns for us, was the way the horn felt in the performers hand. 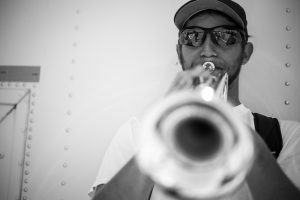 As we went from the initial prototypes through all of the iterations leading to the versions available now, we not only focused on the way the horn played, but the ergonomics of how it felt to the performer. 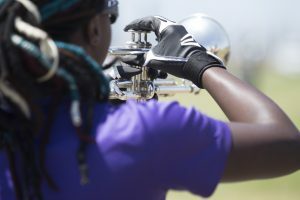 Marching band and drum corps performers practice a lot, and the horns are almost always in their hands. The instrument is essentially an extension of the performer, so it needs to feel like it’s part of the performer. By slightly moving the valve casing, or the first valve U-hook, or where we bent the tubing on the Hybrid-Euphonium near the left hand, it all played a part in making the instruments look like they do, and how they feel in the performers hands. Another consideration with how a brass instrument is “wrapped” is the length of tubing. Many times, instruments will have a long tube, but it is then bent back and forth once, or several times, for myriad of different reasons. You’ll find with the a lot of the System Blue Professional Brass instruments, the tubing is more of a “pure shot,” the actual length of the tube. We do this because, the air then travels in a more singular direction, versus constantly changing directions. As instrument designers, we always try to keep the air moving from the receiver to the bell with the most limited amount of “detours” as possible. Tell them what you’re going to teach them. Also known as “closure,” this is when I might have summarized the content of the lesson and referenced my “anticipatory set”. (My “tell them what you’re going to teach them” introduction). There’s nothing wrong with this approach technically, but it doesn’t genuinely engage the student the way it’s intend to. By telling them up front what I plan to teach them, I allow them to formulate an opinion about the subject matter. And unless I get to the “good stuff” right away, the non-verbal cues are likely to spread rapidly and my lesson is sunk before it even launches. Have you every been so passionate about someone or something that you thought about it all the time? Maybe it was a car you dreamed of owning, or taking a trip somewhere exotic, or maybe it was someone you really liked but didn’t know just how to express it. Have any of you ever felt like that? Me, too! You might express your feelings in a blog, or maybe a diary (if you know what that is! ), or maybe you’d write a poem or a song. I think you’ll agree, by going through the back door and using a “sneak attack” approach, the lesson becomes engaging and, perhaps, even relevant. This approach doesn’t diminish our lesson. It capitalizes on the very thing that music does so well: it tells a story. And if a story doesn’t exist, then we, the teachers, might have to create one! As a young teacher, I often thought I had to bring the kids to me for them to learn. Now I know that I must start by going to them, and then lead them gently and persuasively in my direction. 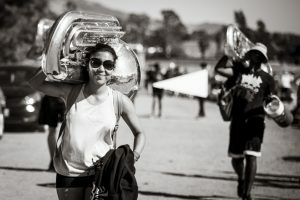 Does The Mouthpiece Really Matter? The System Blue mouthpieces were designed to specifically accompany the System Blue brass instruments, but also work on their own with any set of instruments. 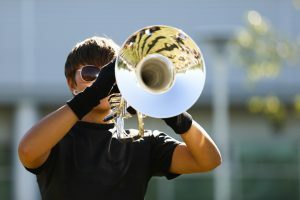 Using a matched set of mouthpieces, even if the instruments aren’t matched, can greatly improve consistency in tone, timbre, and intonation on the marching field. 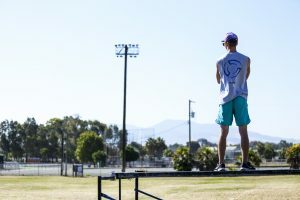 The System Blue mouthpieces were designed to give clear articulation from close and far distances, help performers endurance during long rehearsal sessions, and be somewhat forgiving while marching around a football field. The System Blue TR1 is more of a lead mouthpiece, while the TR2 is more of a section mouthpiece. Let the audition reflect the duties of the position. Be sensitive to the other demands on students’ time. 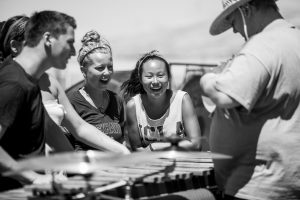 If your student leaders help teach marching, then consider having a marching component to the audition. Similarly, it’s seems only logical that student leaders should have to demonstrate musical competency as leaders of a musical organization. Consider an achievable playing audition as part of the screening process. 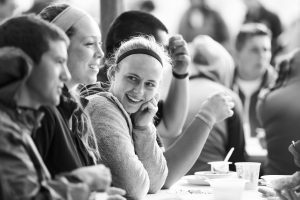 Training student leader candidates may take several weeks. When designing your training schedule, keep in mind that the spring is often a very stressful time for high schoolers with AP exams, term papers, and other big projects on the horizon. Rather than post a “mandatory” schedule of training sessions, consider offering a “pick one” approach. That is, offer 2 identical training sessions (or even 3) per week and allow the students to select the one that works best with their schedules. This keeps them from being so stressed and shows your sensitivity to their lives outside of band. You’ll be surprised at how many kids show up to the duplicate sessions to hone their skills. The more skill-based the audition, the more likely everyone will be ok with the outcome. I used a three-phase audition: Phase 1, playing and marching; Phase 2, teaching; Phase 3, conducting (not every student participated in all three phases. For more detailed info, contact frank@systemblue.org). Be specific with your expectations and be certain the student understand those expectations clearly. This will help them see themselves more objectively. When the audition is too subjective, it can appear that the directors are “playing favorites” rather than selecting the “best” leaders. A good training and selection process will almost always select the best leaders, but only if the tryout is congruent with the job itself. Here’s another strategy to consider as you design your tryout. In the words of author Stephen Covey, “Begin with the end in mind.” That is, ask yourself what you want in a student leader, and design training and tryouts to identify and reveal those individuals. What is Bore Size, and Why Does It Matter? Trumpets have what is called cylindrical bore, which is when the bore diameter is consistent throughout the instrument until you get towards the bell section when the flare begins. Cylindrical bores give a well projected and direct sound. Typically, a medium bore (the SB10) may be a little easier to play from an air standpoint, have a slightly sweeter sound, and can benefit younger players. A larger bore (the SB12) may have a broader sound, have less resistance through range and volume, and benefit lead type players. One is NOT a beginning horn while the other a professional, as many professionals play on medium size bores. A sports analogy would be size and weight of a baseball bat… One player may like a smaller lighter bat to increase bat speed, while another may prefer a larger heavier bat to increase power.